It’s milk that generations will remember. Now a Huddersfield farm is hoping to recruit a new army of admirers for raw, unpasteurised milk with the cream on top. Dairy farmer Jeremy Holmes has installed a raw milk vending machine, which allows customers to fill a bottle straight from the farm, as quickly as four hours after the cows have been milked. It’s one of the ways he plans to fight back after the fierce battle between milk producers and retailers over pricing. And even though many health experts warn against drinking raw milk, Mr Holmes believes it will be popular. Read more. A special milk labelled ‘for farmers’ and sold at a premium has worked – and is now three times more popular than Evian water. And now Morrisons, who were the first supermarket to introduce an increased price milk, have raised the price even higher, after acknowledging that people are prepared to pay more for the white stuff. The supermarket chain’s ‘Milk For Farmers’ charges customers 10p a litre more than its usual milk with the promise that the extra will go to hard-pressed dairy farmers. It was introduced in October as a response to damaging protests and blockades organised by Farmers For Action in the late summer and autumn by farmers, notably at Morrisons’ massive regional distribution centre next to the M5 in Bridgwater, Somerset. Read more. Dairy Crest will hold the milk price it pays its farmers for October, both for its Davidstow and liquid milk contracts, according to the business. Read more. Dairy industry representatives have welcomed the European Commission’s £362.5M (€500M) aid package for farmers but criticised its refusal to lift the intervention price. Read more. Tesco has been praised for paying more for milk used in cheese over the winter months to processors and dairy farmers by the National Farmers Union (NFU). Read more. Tesco has agreed to increase the amount it pays farmers for milk used to produce cheese, in a major victory for the dairy industry in its battle with supermarkets. Britain’s biggest retailer will pay farmers a price based on the cost of production in what farming leaders described as a significant move. Tesco already pays a price linked to the cost of production for milk itself, but it is the first major supermarket to extend the link to cheese. The move means it will pay 29.93p per litre for milk in cheese over the winter period, according to the National Farmers Union. The NFU has said dairy farmers face a “state of emergency” after a 25% fall in the wholesale price of milk in the last year. 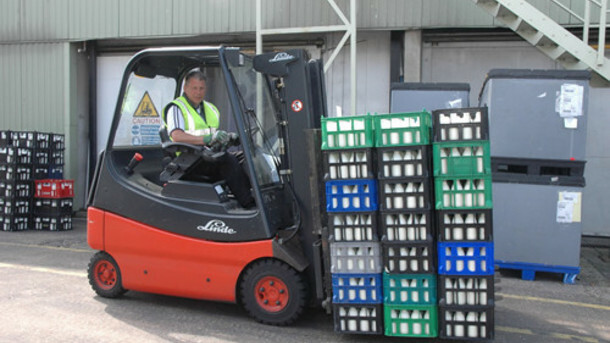 The average farmgate price of milk stands at 23.35p a litre, below the estimated cost of production of 30p a litre. Farmers blame supermarkets for the slide in milk prices, saying it has been used as a weapon in the industry price war and that retailers are not doing enough to promote British-sourced products. In protest they have blockaded distribution centres and herded two cows through an Asda store in Stafford. Read more. 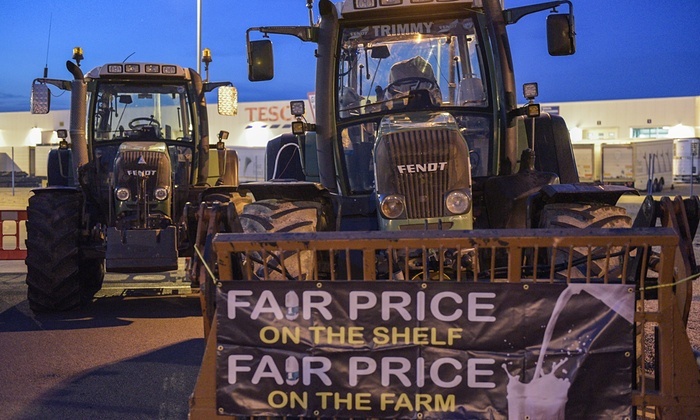 Protesting dairy farmers say they shut down a Morrisons depot for 11 hours on Thursday night as part of a continuing protest over milk prices. 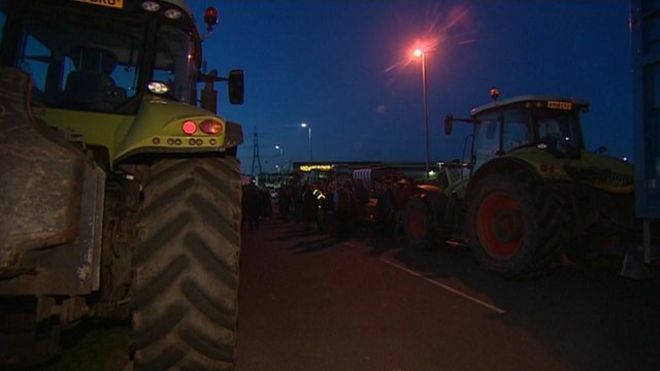 Tractors lined the road to the store’s distribution centre in Bridgwater, Somerset from 1600 BST, leaving at 0300 following talks with police. Farmers have accused the supermarket of backtracking on pledges over the price of milk used to make cheese. Morrisons said it was disappointed at the actions of “a minority” of farmers. The supermarket announced weeks ago it would create a new “Milk for Farmers” cheddar which would “deliver the equivalent of 10p-a-litre back to farmers”, amid a row over the price of milk. Read more.